We all want to do something amazing for our loved ones on Valentines Day! Some years that looks like expensive gifts and fancy dinners. But what about this year? If you are like me, then all I really want is us two enjoying a moment that is special. 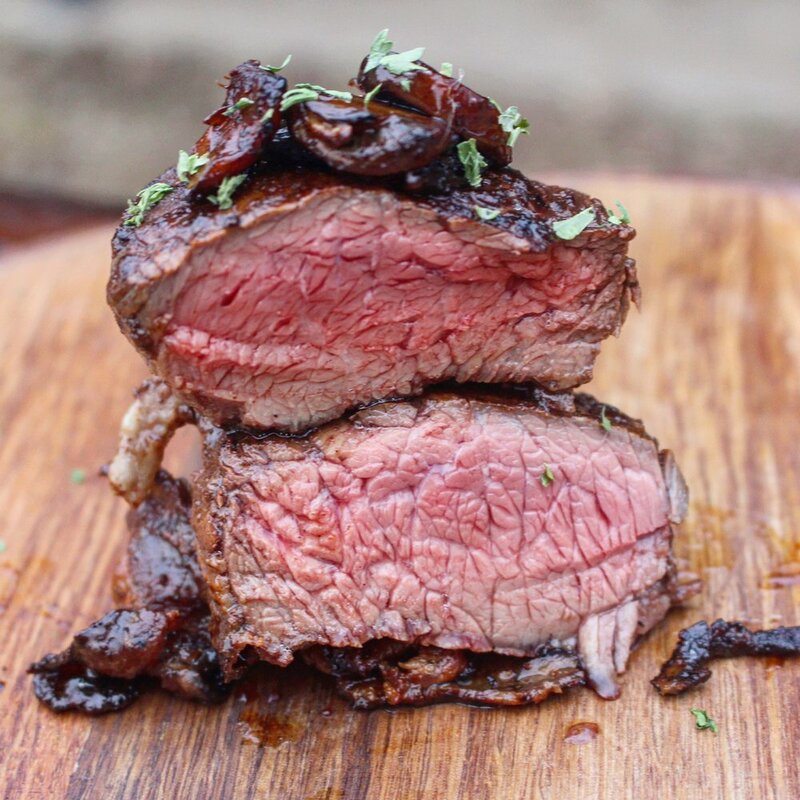 That is why I am sharing a favorite recipe of mine: the Bourbon & Bacon Filet Mignon. 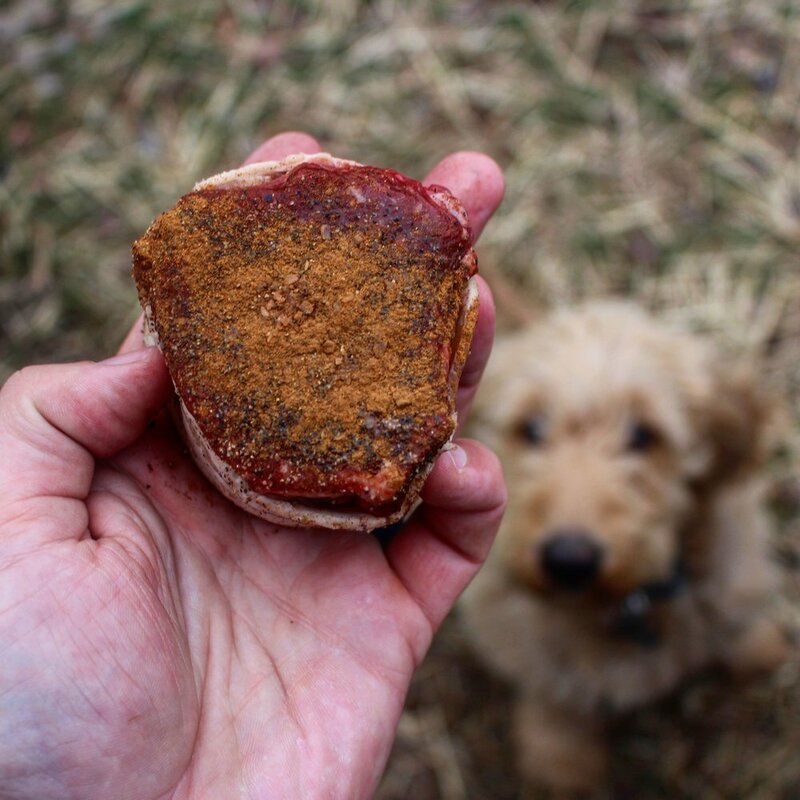 Take your expensive & fancy dinner home and put it over the fire with this delicious recipe. 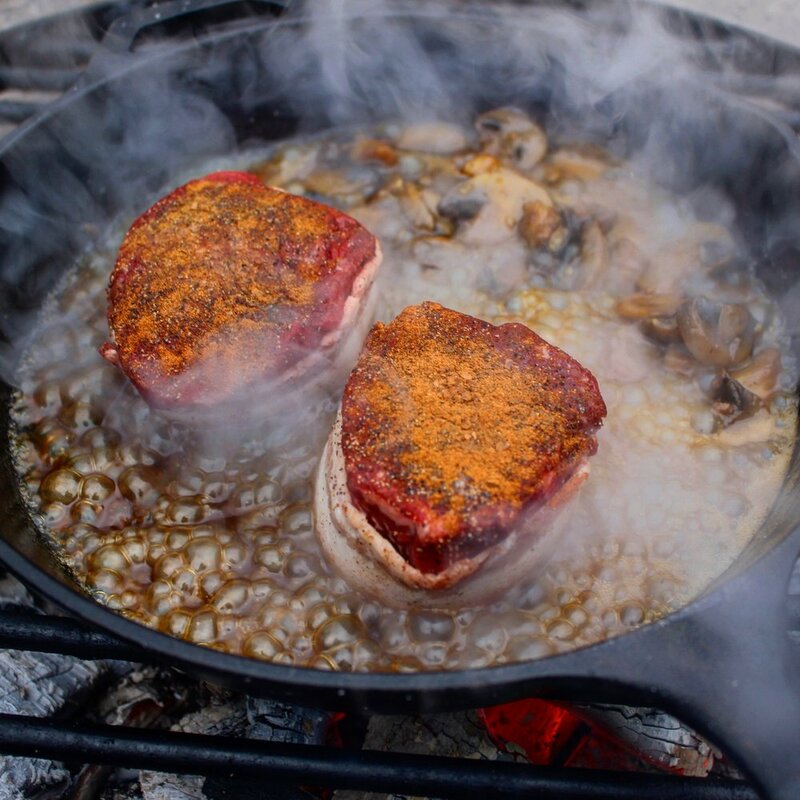 This bacon wrapped Filet Mignon is glazed in a bourbon & brown sugar mixture that is both sweet & salty. It makes an amazing crust on the Filet Mignon which pairs perfectly with a Cabernet or Merlot. Just make sure to add some Cowboy Charcoal & hickory wood chunks to make a flavor and a night that you will both remember! RELATED RECIPE: Thinking Chicken for Valentines Day? Try my Green Chile Chicken Recipe! 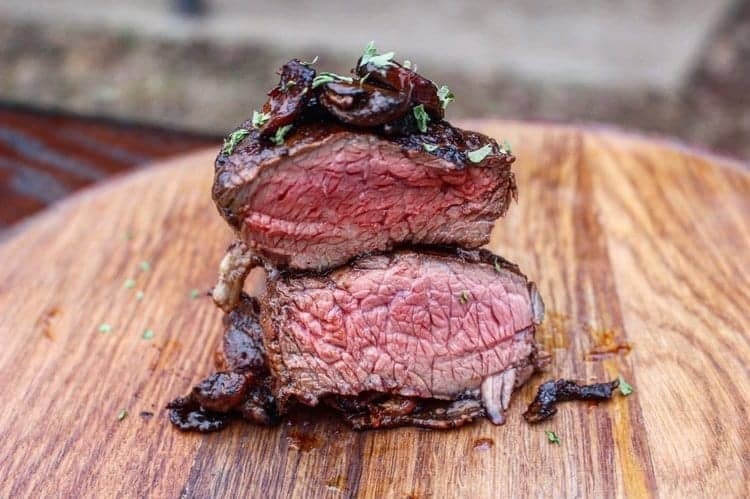 What else can I serve with this Bourbon & Bacon Filet Mignon? There are plenty of side dishes to serve with the Bourbon & Bacon Filet Mignon. I highly recommend some starting with a Caesar salad (yes, I said salad). Add some grilled asparagus with your Filet Mignon as its veggie. Finally, I would include some baked potatoes wrapped in tin foil and loaded with cheese, chives, & sour cream. Don’t forget some dessert too! You can add a skillet cookie to the grill for a complete date night! In the end, just make sure to enjoy! Glazing those steaks & mushrooms. Sliced and ready to eat! Bourbon and bacon make everything better. Even filet mignon! In a bowl, mix the bourbon, brown sugar, garlic cloves, lemon juice, plus salt & pepper to taste. Stir thoroughly and place to the side. Next, wrap steaks with bacon and use toothpicks to keep in place if necessary. Season with salt, pepper & cinnamon. Use some Cowboy Hardwood Lump Charcoal to light fire and let burn for 10-15 minutes. Once charcoal is white hot, disperse over grill evenly for direct grilling. Optional: For a more intense flavor, add some hickory or apple wood chunks to the top of the charcoal. Set cast iron pan over fire about 2 minutes before cooking in order to heat up evenly. When pre-heated, add butter to pan and let melt. Once melted, add the bourbon mixture to the pan and let simmer for 8-10 minutes or until it starts to thicken. Occasionally stir mixture, and pull off fire if it starts to blacken! Add mushrooms to skillet once the bourbon mixture has thickened and stir for 2 minutes. 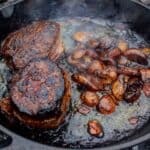 Push mushrooms to one side and place steaks in the skillet. Let steaks cook for 7-8 minutes per side or until internal temperature is at 125F (medium-rare). Make sure bacon is cooked thoroughly as well. Pull steaks & mushrooms off grill and let rest for 10 minutes. Serve & enjoy your Valentines Day!